With 2018 behind us, we reflected on another active year in the Canadian bond market. 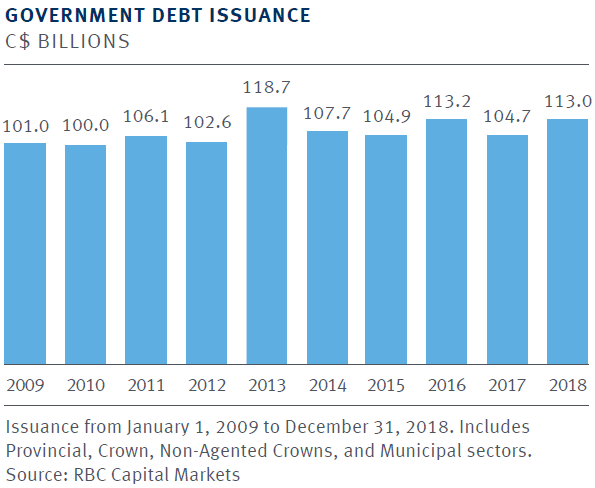 Our 2018 Commentary and Market Review report provides an overview of key themes and developments in the Canadian Debt Capital Markets and summarizes our outlook for 2019. 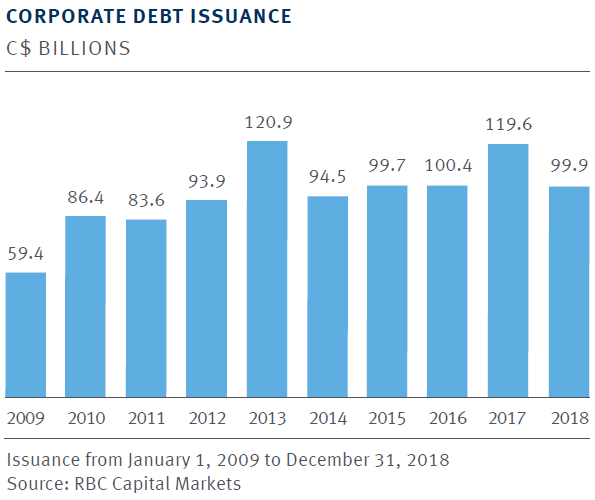 Canadian investors continued to demonstrate a strong appetite for corporate credit through most of 2018 as evidenced by moderate new issue concessions, oversubscribed orderbooks and broad distribution supported by a steady supply-demand imbalance. However, softer market tone in Q4 pushed concessions wider, while participation levels moderated amidst net redemption activity into calendar year-end. Nonetheless, we anticipate corporate volumes to remain healthy in 2019, albeit modestly lower than the last several years of fairly elevated issuance. Corporate issuance in 2018 marked the fourth most active year of all-time as issuers capitalized on a steadily improving macroeconomic landscape through most of the year and a sustained investor bid for corporate credit to print C$99.9 billion of new issue supply. Banks and other financial issuers were fairly dominant with C$57 billion of financial supply priced during the year, while non-financial corporate sectors fell short of a record 2017 with C$35.9 billion of issuance. Furthermore, markets for floating rate product, BBB rated issuance and Automotive supply all registered near records during 2018. 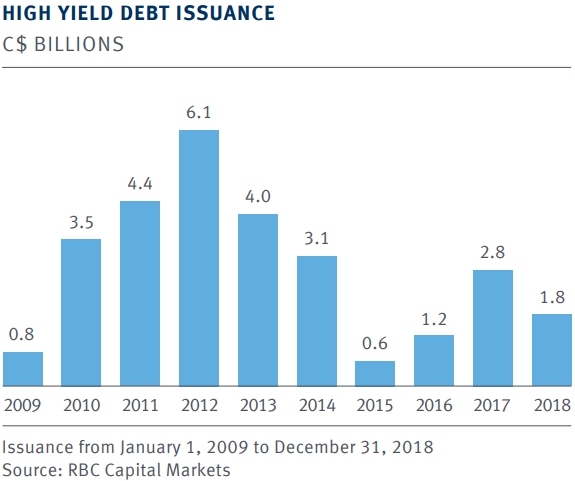 The healthy level of total issuance during the year is indicative of the capacity of the Canadian market to absorb significant volumes from a wide range of domestic and foreign-domiciled issuers. The Canadian corporate hybrid market has experienced steady issuance since TransCanada Trust’s inaugural C$ corporate hybrid offering in May 2017. The nascent C$ corporate hybrid market is expected to continue to expand in 2019 as well-established issuers look to access a new source of junior capital that is tax-deductible and receives favourable ‘equity treatment‘ from rating agencies. In addition, investors continued to demonstrate strong demand for hybrid product as yield-seeking remains prevalent amidst the current market environment. The Canadian high yield market had an active year with C$1.8 billion of new issue supply priced across 12 transactions, including four debut offerings. The year featured a resurgence of diversified high yield issuance with nearly three-quarters of supply originating from non-energy names, although the energy sector still remained active with several E&P issuers accessing the market over the course of 2018. In addition, ‘B rated’ and unrated issuance continued to remain strong during the year as yield-seeking investors continued to demonstrate a higher risk tolerance towards the lower end of the rating spectrum. Canadian issuers have been particularly active in global debt markets as they have looked to capitalize on favourable funding costs on a swapped-equivalent basis, investor diversification, depth of demand, and in select cases, to satisfy natural currency requirements. In 2018, offshore activity continued to expand, with Canadian issuers raising an aggregate of ~US$209 billion primarily across USD, GBP and EUR offerings. International issuers have also remained active in the Canadian market with Maple supply reaching C$9 billion in 2018, surpassing all annual issuance levels post-crisis, with the exception of 2017 (a high-watermark year). It was another active year for Public Sector issuance in Canada as domestic supply reached C$113 billion, which is a Top 3 year for domestic supply and 6% higher than 2017. Higher provincial borrowing requirements and elevated domestic issuance drove supply in CAD, which was spaced out over the course of the year despite budget blackouts, election blackouts (Ontario and Quebec) and heightened rate volatility in the latter part of the year. Offshore funding for Public Sector issuers totaled C$20.3 billion (eqv.) in 2018, representing 23% of total supply; this level of offshore supply is below the C$29.5 billion (eqv.) in 2017, though well above prior years. USD, EUR and AUD were the key offshore currencies for borrowers in 2018. The C$ Green market has grown rapidly over the last three years with 2018 registering an all-time record for C$ Green issuance of C$6.3 billion, representing a growth of 3.9x since 2016. Of particular note, the Green market has continued to gain traction in the corporate space, while six government issuers completed Green Bond offerings during the year, with inaugural issues from CPPIB, City of Toronto, City of Vancouver and TransLink. "C$ Green Bond issuance registered an all-time record in 2018. SSA clients priced some of the largest C$ Green offerings to date, while corporate issuers continued to expand into the market."